Should South Korean schools point the way to American reforms? Last year President Barack Obama touted hardworking South Korean schools as a role model for our education system. “Our children spend over a month less in school than children in South Korea,” he told the U.S. Hispanic Chamber of Commerce. “That is no way to prepare them for a 21st-century economy.” If Obama’s point that U.S. students need to study more had many nodding in agreement, choosing South Korea as a benchmark for excellence in education had others scratching their heads. Should the United States emulate South Korea by vastly increasing the number of school days and adopting its other educational practices? If higher test scores and graduation rates are the goal, the logical answer would be yes. After all, the United States’ position in the PISA surveys is always far below average, seldom cracking the top 20 list. Yet a deeper look at the South Korean model suggests that its success comes at a price. South Koreans attend school 220 days per year, almost two months more than the 180 days of Americans. (The Japanese enroll an astonishing 243 days per annum; South Korea abdicated first place in 2005 when its students ceased going to school half days on Saturday.) What distinguishes South Koreans from everyone else, however, is the immense number of hours they study outside the classroom. High schoolers, and even middle schoolers, in South Korea are often engaged in scholastics until midnight or 2 a.m. After taking classes in up to 11 subjects, they attend private academies called “hagwons” where they obtain supplemental learning. The bottom line? Most South Korean children spend 13 hours a day or more with their bottoms glued to a chair. 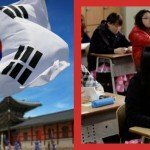 Although these grueling schedules help South Korea’s high test scores, the nation is remarkably inefficient at another PISA criterion known as “study effectiveness.” When PISA calculates each nation’s achievement based on the number of hours spent studying, South Koreans rank only 24th out of 30 developed nations. The winner in study effectiveness is Finland, the world’s true PISA champ, placing first in science, second in math, and second in reading. Finnish students only attend school 190 days per year (two weeks more than U.S. children) and receive less than a half-hour of homework per day. In the face of high expectations and high-stakes grading, South Korean teens don’t enjoy what many would consider a healthy balance of school, play, and sleep. So-called enrichments such as sports and arts are at a low premium, with many high schools lacking modern gymnasiums or sports teams. Supporting student social life is also a low priority compared to U.S. schools. A New York Times article about one of the nation’s most competitive high schools describes a teacher scolding two teens for holding hands. Finally, discipline in schools is meted out with canings by teachers for everything from disobedience to low test scores. Relentless pressure and long hours, followed by tests that are regarded as the marker of all future success, produce unintended, and sometimes tragic, results. Many South Korean kids are alarmingly unready for university work. The Korea Times reported that Samuel Kim, a Columbia University scholar, assembled research revealing that 44% of South Korean students at top U.S. universities drop out. This digit exceeds the dropout rate for students from the United States (34%), China (25%), and India (21.5%). A principal reason for the lack of success is that the rote learning in Korean schools does not prepare students for the creative, active, and self-motivated form of learning U.S. universities require. The system takes a profound emotional toll as well. South Korea’s student suicide rate is among the world’s highest, with 17 out of 100,000 students killing themselves — sometimes after a poor performance on entrance exams or because children cannot endure their parent’s disappointment. One 2008 poll indicated that 58.8% of students contemplate suicide. Should we use South Korea as an object lesson in excellence or how a culture of high-stakes testing can go too far? Either way, South Korean schools do deserve recognition for their innovative use of technology. In 2001 the country became the first to provide high-speed Internet access to every primary, middle, and high school. Presently, South Korea is aiming for two high-tech goals: By 2013, “flexbooks,” or digital textbooks, will be given to every student — these 3-D learning tools are easy to update with links to online articles and visual and audio material, and they’ll lighten backpacks that have been weighed down with heavy outdated textbooks. Robots for kindergarten are also due in 2013. IROBI will be a teaching assistant and a convenient “friend” who can register students, converse, sing songs, take photos, read stories aloud, and show films on its belly that has a seven-inch screen. Though U.S. teacher unions might reasonably object to a non-human teacher entering the labor market, no doubt many educators would welcome a professional stapler and housekeeper to help them with their endless classroom chores. Hank Pellissier is a freelance writer on education and brain development, the founder and director of the Brighter Brains Institute, and a college admissions advisor offering free presentations and affordable (sliding scale) advice on college admissions. Take a spin around the globe to spice up your kids' lunches! Are we teaching math all wrong?